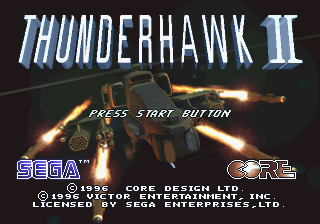 Thunderhawk II (サンダーホーク II) is a helicopter shoot-'em-up game developed and published by Core Design. It is the sequel to the Sega Mega-CD game Thunderhawk. Similar to other combat flight simulators, you pilot a AH-73M Thunderhawk through a variety of missions spread across the world. Like its predecessor, the game takes a first person perspective of the action, but unlike its predecessor, the world is presented in full real-time 3D. The game was developed with the Sega Saturn in mindMore..., and was later ported to the Sony PlayStation and Windows PCs. Initial plans were to release Thunderhawk II on the Sega 32X, but work was transferred over to the Saturn after the 32X's demise. Thunderhawk II goes by several names in different regions of the world. It is known as Thunderstrike 2 in North and South America, and it is known as Firestorm: Thunderhawk 2 in Europe. Germany, however, call it Thunderhawk 2: Firestorm. Main article: Thunderhawk II/Magazine articles. README.DOC TXT 6,077 Messages from the developers. SMP_ABS.TXT TXT (Abstract) 35 About this game.